My boyfriend Allan and I hang out every Sunday. We enjoy eating out (most of my food blog entries are from places we frequent) and visiting places of interests. Since we are 30-something geeks, museums and bookstores are included in the mix. 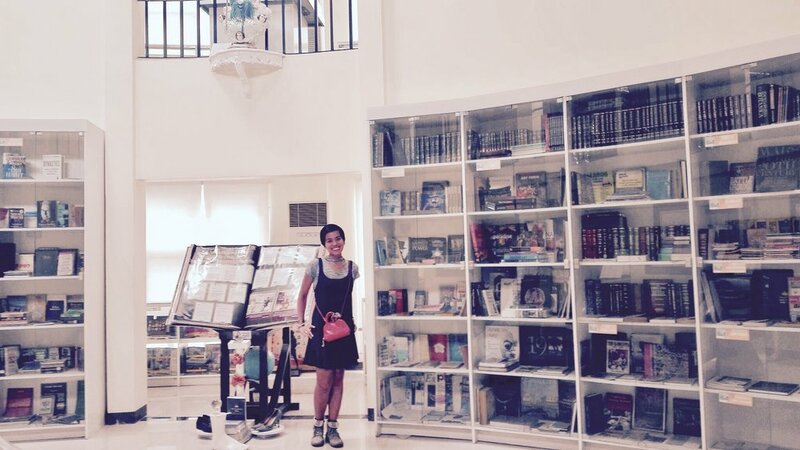 Today, we visited the Book Museum at Marikina to surround ourselves with publications from around the world. We were not disappointed! While most visitors were underwhelmed, we were satisfied with our short tour there. You may browse their collection, except for the glass-encased ones which are precious artifacts from another era. I especially liked their tiny books and Rizal collection. They had this foot statue to symbolize mobility of information and civilization. It is also noteworthy that Marikina is known as the shoe capital of Metro Manila since this is the main industry in the city. If you are into osmosis trips like me, this is a fun place to take your special someone or even your kids. Printed books will never replace ebooks. It is also a reminder that books can inspire you to dream, travel, and aspire for the betterment of society. 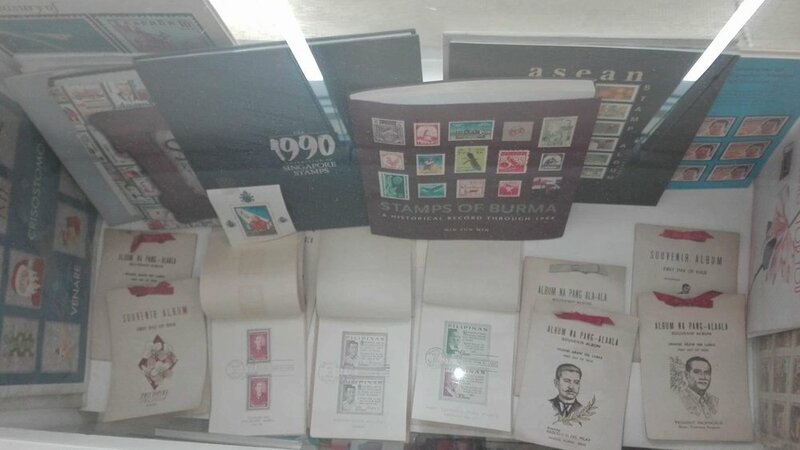 Philately will always have a special place in my heart. This was a memorable trip for us as we both like being surrounded by books and odd objects. We also enjoyed the ethnology center in the compound. There were native artifacts from different tribes in the country. It was a colorful display of the rich culture of our different regions. The museum can be easily searched through navigation apps. Their museum curator is knowledgeable and for P100 per person, you will be surrounded by books and culture. We highly recommend this museum for your next Sundate! Every girl needs a little sparkle in her life. However, traditional jewelry can be made of materials which are not sustainable and ethically-sourced. As a result, millennials like me have become selective of our personal adornments. This is why I was delighted to find local brand Rich Earth Jewelry. Their pieces are ethereal and made of sustainable materials which enhance the quality and craftsmanship of their work. Rich Earth Jewelry Signature Artwear™ Pieces are handcrafted with hammered, 24k gold plated aluminum metal, intricately linked for that truly one of a kind design. The hammered links have an elegant finish that will complement and grace one's ensemble. -from the Rich Earth Jewelry website. I personally like the fact that part of the proceeds of their sales go to worthy causes such as Save Philippine Seas and the Mano Amiga Academy. In addition to that, their pieces are lightweight and guaranteed to keep their beautiful appearance for years to come (with proper care of course). Their lovely jewelry are fairly priced too so you can buy yourself an investment piece which will not break the bank. They look classy with either casual clothes or your fiercest ensembles. There is something for everyone, whether you prefer dainty pieces or statement necklaces. This Filipino up and comer will definitely sail the seas of the fashion landscape while helping save our natural resources and educating our future movers. I hope to own a piece from Rich Earth Jewelry someday. Their dreamy Instagram account will definitely be one of your favorites in no time. Go check them out now! Contrary to popular belief, their Maginhawa outlet is not a factory or discount store. It is simply their HQ and flagship store. You can expect their widest stocks and fresh-off-the-cutting-board bags and sandals. There are even some bags which cannot be found in their mall branches. I love looking around here because the staff are kind and accommodating even if I don't have money at the moment to afford anything. In fact, when I asked them if I could take pictures so I could feature them on my blog, they gladly obliged. They asked me if I could write that they offer repairs and zipper replacements. Of course, I said yes. There's something for every taste and budget here. They have small leather goods too like wallets, card holders, and cute animal keychains. They even have coin purses for those of us who take public transportation and want to separate those coins from our main wallets. Their sandals are comfy and sturdy. Mine lasted for years- even sturdier than Havaianas. I used to own another black satchel from them four years ago but I have since donated it to Human Nature's fundraising garage sale last year. I also owned a pair of pretty turquoise flip flops from them which have outlasted my Havaianas. I have worn them through rain and shine and they only left my feet when I gave them away to charity. Now that I'm 30, I find that my taste has evolved to quality, sturdy goods. I have a neutral palette preference now. I also find myself gravitating towards items which will last me through. I have stopped giving into fast fashion, so local brands like Our Tribe is on my radar. I will definitely buy a handbag or a pair of sandals from them again when I have the means to do so. If you want Filipino-made leather goods which are reasonably-priced, go for Our Tribe! Always keep an eye on your Our Tribe bag though because they do look posh so don't be like me!